(Nanowerk News) Legions of viruses that infect the leaves of tobacco plants could be the key to making power plants safer, heating and cooling of buildings more efficient, and electronics more powerful. These tiny protein bundles, which were once a threat to a staple cash crop of the nascent United States in the 1800s, are now helping researchers like Drexel University’s Matthew McCarthy, PhD, better understand and enhance the processes of boiling and condensation. McCarthy’s research focuses on phase-change heat transfer—the boiling, evaporation and condensation of fluids. These processes, which are ubiquitous in nature, have also become integral to the technologies that keep our society running. Steam turbines generate electricity in massive plants that power cities. Boiling water is a time-tested purification method that is still used to treat water supplies. And both heating and cooling processes are part of the systems that control our indoor climates on a daily basis. If McCarthy’s work can make phase-change heat transfer even a little more efficient its impact could be huge. To improve on something that nature has been doing since the beginning of time, and people have been refining for thousands of years, McCarthy’s looking not at the liquid or the heat source, but at the surface that links them. When a liquid reaches critical heat flux a thin layer of vapor blankets the heat-transfer surface. This vapor insulates the liquid from the heat source and it drastically reduces the surface’s ability to dissipate heat to the liquid. This results in “burnout,” which means dangerous increases in surface temperature occur very rapidly. After critical heat flux and burnout occur, it is extremely difficult to re-wet the surface and reduce its temperature. McCarthy’s goal is to create nanostructured coatings for the heat-transfer surfaces that can delay or prevent the vapor barrier from forming in the first place. The ideal structure for higher heat transfer during boiling, according to McCarthy, is one that draws in the liquid and quickly rewets when the water does transform into a vapor. 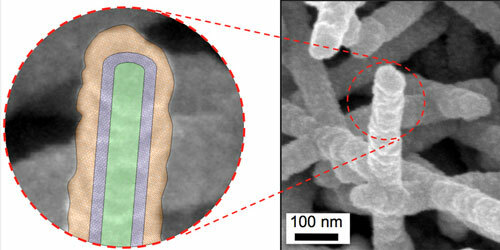 Scanning electron microscope image of the virus-templated nanostructures (right), including a schematic of the core shell structure (left) where the Tobacco mosaic virus is shown in green, palladium in purple, and nickel shell in orange. “The only way to delay CHF is to keep the surface wet at higher and higher heat fluxes.” McCarthy said. To keep the boiling surface wet, McCarthy’s team is employing a technique that’s more frequently used to keep athletes dry. Wicking, or capillary effect, is the secret behind the high performance and thermal apparel that draws moisture away from the body. This material, which keeps people cool during a workout or warm in the winter, can also keep a boiling surface wet—thus staving off critical heat flux. The trick to making a wicking, or hydrophilic material, is strategically increasing its surface area to draw the liquid down a path toward region of lower density. Sponges do this with their pores and air pockets. McCarthy’s team is creating its own super-hydrophilic surfaces by coating them with thousands of nanostructure tendrils. This is where the viruses come in. The Tobacco mosaic virus, is a simple virus consisting of a single strand of RNA surrounded by thousands of coat protein strands. It was the first virus ever to be identified, in 1930, and one of the most extensively studied—likely because they were destroying an important cash crop at the turn of the last century. Today the pests have carved out a new niche: self-assembling scaffolding for building nanostructures. McCarthy has been directing minions of Tobacco mosaic viruses since he was a post-doctoral researcher at the University of Maryland, when his lab used them for research on nanostructured battery electrodes. He now grows his own genetically modified strain of the virus on the tobacco plants in his lab. To make a test surface, McCarthy pours a solution containing billions of viruses onto his selected substrate. The rod-shaped viruses attach to the surface, forming a bristly layer of nanostructures. The tiny forest is then coated with a thin shell of metal that rigidly attaches the nanostructures. Once coated, the viruses are rendered inert. What they’ve left behind is a coating of evenly spaced tendrils—“metallic grass,” as McCarthy calls it. This “grass” creates a capillary effect, which allows the coating to wick liquids across it and keep them in contact with the heat-transfer surface. With help from the viral framework, McCarthy’s lab can produce nanostructure-coated test surfaces of all shapes and sizes in a matter of hours. One “batch” of McCarthy’s Tobacco mosaic viruses can quickly coat a surface and turn it into a forest of tendrils that are perfect for wicking water. As part of his National Science Foundation CAREER award research, McCarthy’s team will look at the performance of dozens of different surface configurations with variations that range from the spacing of the nanostructures, to the overall shape and the metallic coating. Hierarchical structures comprised of virus-templated nanostructures conformally coatings silicon microstructures. Preliminary results are already quite promising. The super-wicking surfaces have shown a 240-percent increase in critical heat flux, which means the maximum heat transfer rate achievable before critical heat flux occurs is more than three times as high as it was using the uncoated boiling surface. The “metallic grass” coating also results in a tripling of the efficiency of the boiling process. So if two pots of water—one with a nanostructure coating and one without—were heated to the same temperature, the pot coated with nanostructures would produce twice as much water vapor as the uncoated pot. And, as McCarthy notes, a little improvement to the efficiency of something that’s widely used goes a long way.